It is not an unusual occurrence in Nigeria since the First Republic, to have a rancorous and baleful transition between an outgoing administration and an incoming one, especially when the individuals involved belong to different political parties. The tune may however be different if a government is transiting within the same political party. This scenario had been witnessed at both state and federal levels of government, especially since the return to civil rule in 1999. But the situation has become more pronounced now, after the just concluded general elections, as some governors and their incoming successors have already started bickering, with both parties accusing one another of perpetrating unwholesome acts. In the fallout of this, there had been exaggerations and understatements, concoctions and conjectures, innuendos and insinuations, lies and half-truths as well as facts and truths, depending on the side one is viewing the issue from. 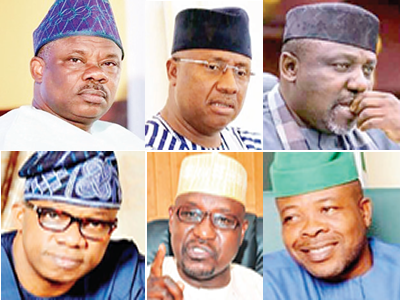 Many political analysts have argued that all these arose in order for some outgoing governors and their successors to play politics with issues on ground and give excuses why they are leaving an empty treasury or why they cannot hit the ground running. A political analyst, Comrade Oladunle Agbomila, noted that the situation will continue, as long as the political atmosphere is saturated with pecuniary gains, and political players have the mentality of ‘winner takes all’. “Politics is supposed to be a free contest devoid of all these rancour but the money involved is too mouth-watering for them not to fight. While some governors are busy increasing salaries, others employing more workers, all in a bid to increase the wage bill and set landmines for incoming administrations. “Don’t you know that, if a new governor as many hurdles to cross in his administration, he or she won’t have time probing his predecessor as he would be busy looking for how to succeed. In the same vein, if an outgone governor is facing EFCC and battling with court case, he won’t have the time to plot against his successor. This is why they go through all these dirty bickering”, he lamented. A look at few cases at hand strengthened Saturday Telegraph investigations across the states, which revealed that, such unwholesome bickering by the outgoing and incoming governors, had gone a long way in undermining the true essence of governance. In Bauchi State, the outgoing governor, Muhammed Abubakar, had been alleged of embarking on last minute efforts to make governance unbearable for the incoming administration. Abubakar, who is yet to recover from the shock of his defeat in a state broadcast in a British Broadcasting Corporation (BBC) Hausa Service, said his defeat is still a shock to him, saying he never expected defeat at the polls. Fresh facts emerging from the camp of the governorelect, Alhaji Bala Mohammed, revealed that Abubakar was secretly recruiting teachers and other civil servants with the aim of making the incoming administration to lose focus in delivering its electoral mandate to the people of the state. Mohammed had also recently accused Abubakar of awarding contracts and making last minute financial transactions, saying that the outgoing governor is busy increasing the state’s debt burden. “It beats my imagination that instead of focusing on closing its books, the outgoing government has chosen the dishonorable option of emptying the treasury and overburdening the government with enormous debt again.” The incoming governor further alleged that there were plans on ground to ensure that part of the Paris Club grant received from the Federal Government, which amounted to N4 billion, would be hastily disbursed in a matter of days to cronies, phony companies and their likes for the renovation of schools. “We are aware of the deliberate and systematic attempt to move state assets to unknown destinations, sometimes in broad daylight. The civil servants who are involved in this systematic theft will not go unpunished. “For the avoidance of doubt the incoming administration will conduct a thorough capital inventory and forensics audit of all financial transactions”, Mohammed had threatened while warning the beneficiaries of such largesse to be wary of the unwholesome act. In its reaction, the Bauchi State Government denied all the allegations, saying they were aimed at tarnishing the records of the Abubakar’s administration. Speaking to our correspondent in a telephone interview, the state’s Commissioner for Information, Alhaji Ibrahim Sade, denied all the allegations, saying they are “false and unfounded.” “As far as we are concerned, we have not employed anybody and we are not planning to employ anyone before the end of this administration, even a single person has not been employed. They are mere insinuations. Adamawa In Adamawa, all seems not well following the defeat of the incumbent Governor, Mohammed Umaru Jibrilla, by the Peoples Democratic Party (PDP) governorship candidate, Alhaji Ahmadu Fintiri. Rumours making the round is that Jibrilla, has in the last few weeks, been embarking on massive recruitment exercise of teachers and civil servants, which observers argue is in bad taste, given the fact that the handover date to the incoming administration is around the corner. Indications to this effect emerged during the week, when our correspondent visited the state’s Secretariat and the state’s Education Board, to behold the convergence of hundreds of applicants, especially youths, who gathered at various ministries either to be enlisted or interviewed for employment into ministries and parastatal before the inauguration of the incoming administration. One of such applicants, Mohammed Abdullahi, who spoke with Saturday Telegraph on the issue, said the process for teachers’ recruitment actually started late last year but was extended till date. Similarly, other applicants who spoke on the ongoing recruitment drive, blamed the outgoing government for not embarking on the exercise long before now, even though they decided to keep it until the All Progressives Congress (APC)-led government was sacked. However, finding by Saturday Telegraph revealed that another fundamental issue that is likely to undermine the incoming administration’s preparedness is the issue of workers’ salaries. It was learnt that as at the time of filing this report, the March salaries are yet to be paid, considering the fact that Adamawa State is one of the state where salaries play a crucial role in all all the 21 local government areas. The outgoing governor is also accused of attempts to award more road contracts, and this is seen as an attempt to undermine and throw a spanner in the works of the new administration. Meanwhile, Fintiri while inaugurating a 65-member committee for the smooth transition, warned the outgoing administration that any recruitment exercise not done before the end of 2018 might not be honoured. In Ogun State, ahead of the May 29 handover date, the camps of Governor Ibikunle Amosun and the governor-elect, Prince Dapo Abiodun, are locked in a fresh tussle over last minute appointments and transactions by the outgoing administration. The development, Saturday Telegraph gathered, has raised tension between the two camps even as they continued to fight each other at the election petitions tribunal over the outcome of the March 9 governorship election in the state. Amosun supported the Allied People’s Movement (APM) gubernatorial candidate, Adekunle Akinlade, in the election but Abiodun, who ran on the ticket of All Progressives Congress (APC), defeated the governor’s anointed to emerge victorious at the polls. Some of the adversarial moves by the Amosun government include the appointments of 21 new permanent secretaries; as well as management and Governing Councils for Moshood Abiola University of Science and Technology (MAUSTECH) and Ogun State Polytechnic, Ipokia. Also, the outgoing government recently announced new General Managers for both Ogun State Broadcasting Corporation (OGBC) and Ogun State Television (OGTV), despite the fact that they had been in acting capacities for almost a year. Supporters of the Governor- elect insisted that the appointments were done in bad faith and would be reviewed upon assumption of office. Some of them recalled that Amosun relieved many permanent secretaries inherited from his predecessor of their appointments, stressing that similar action should not be unexpected. The state Publicity Secretary, Ogun APC Caretaker Committee, Tunde Oladunjoye, specifically accused the outgoing government of awards of contracts, sales and auctioning of government properties, and secret recruitments into the civil service Oladunjoye, in a statement titled, “11th hour transactions: Caveat Emptor (Buyers Beware), said the last minute decisions would not be binding on the new government. He said: “It has come to our notice that the outgoing administration of His Excellency Senator Ibikunle Amosun, is busy with last minute awards of contracts, selling and auctioning of government properties, and secrete recruitments into the civil service, in a way to tie the hands of the incoming Governor, Prince Dapo Abiodun. “While we find these reported last-minutes awards of contracts, withdrawals from treasury, sales of land and illegal recruitment of Senator Amosun’s cronies into senior positions of the Ogun State Civil Service, very shocking, our party wishes to warn the members of the general public that such hurried transactions would not necessarily be binding on the incoming administration. “We urge Ogun State’s top senior civil servants not to be part of the desperate moves of the departing Governor to undermine socio-economic stability of our State, by engaging in, condoning or being part of any act that breaches or constitute a flagrant abuse of laid-down rules, regulations and due process. However, Amosun appears to be unmoved by criticisms over his appointments. Speaking during the week, the governor vowed to work till his last day in office and discharge his obligation to the state irrespective of whatever his critics say or do. The governor’s media aides, when contacted, declined comments on the specific allegations levelled against the outgoing administration by Abiodun’s supporters.